I have creme de miel and I really like it as a lid color with espresso on the OL and crease. What would you wear it with? With oranges, pinks, browns, or greens! too bad you cant get fab&flashy anymore. I have tried to find this beautiful shade, but they wont bring it back. shame. I know! I want this shade so badly along with Firespot but they keep bringing back friggin’ Satin Taupe! grrr! 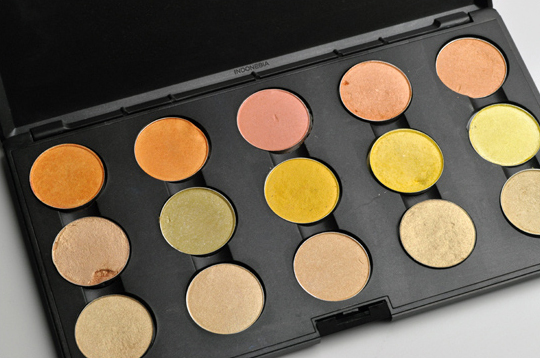 nice collection of eyeshadows! y do they have chunks taken out of them tho? were they cracked? It means my finger slipped and I gouged the eyeshadow with my nail, LOL. Hi Christine, just wondering what you pair Off The Page with? It’s so pretty, but I don’t know what to wear it with! Love it with pinks & purples!